Pressure range : 0 – 100 bar*. No. of stations : 8 nos. Pressure output: through hydro-pneumatic pump. Time range : 0 – 999.9 hours. Panel mounting : Trolley with castor wheels. Set pressure, Actual pressure, Set time, Actual time, Set temperature and Actual temperature. In addition to the above values Pressure & Temperature Vs Time graph could be obtained for any station by attaching a printer to the PC. Pressure Range : 0 – 100 kg / cm sq*. No. of station : 3 nos*. 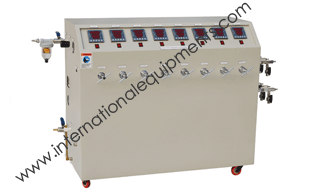 Pressure input : Through compressed air having pressure upto 5 kg / cm sq. Pressure output : Through hydro-pneumatic pump. Panel mounting : Trolly with caster wheel. Power : 230V, 50 Hz single phase.